For those of old enough to have remembered the “old days without” certain technologies, and at those time thought such technologies would never happen, I for one am glad those technologies had been invented. I am glad that the flip “communicators” used in the 1970’s television series Star Trek became common as hand held cell phones. By the turn of the century, nearly all of us were able to afford and use a similar looking communication device as Captain Kirk, the cell phone. But even more impressive, growing up watching that television series, was the concept that one day, we might be able to see each other as we talk to each other. Of course we were already broadcasting images and sounds across the television, but to actually have a conversation while looking at each other seemed impossible as Captain Kirk communicated with his ship mates on the planet below. But then came camera accessories for the computer, which would eventually lead to programs like Skype, Tango, and Facetime. Being away from my children, over a thousand miles away would be so much more difficult would it not be for this new technology. My parents had a custody agreement, which back in the late 1960’s was quite rough on the fathers who virtually had no rights. I do not know the exact orders that my parents had between them, but I do know that I only saw my father, every other Sunday, and for just a few hours. He was not able to see me or my sister. He regularly missed special events in our lives such as birthdays, special events in school, and more. Sure, we could talk on the phone. And we were living just two cities apart from each other, so there was no great distance. In my father’s last years, we often talked about what happened in the past, and how he wished that things would have been different for my childhood. But unlike technology helping with the future, technology cannot give us back the past. But as I continue on through this second year of the divorce process, I am taking the lessons I learned from conversations with my father. Yes, I am a huge distance physically away from my daughters. 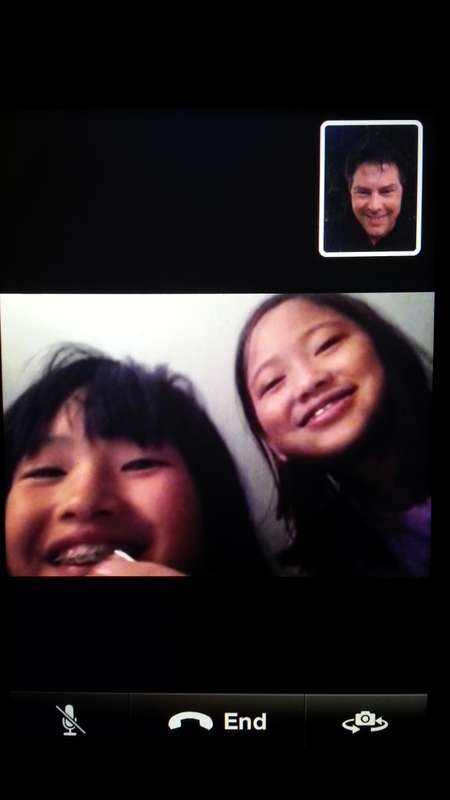 Thankfully, with technology, and a court order, I am allowed to see my daughters at any time, no matter how far apart we are. Every night, we chat with each other on Facetime. We talk about the day’s activities, homework, boys, and upcoming plans, and what we would like to do next time we are with each other. We tell each other we miss each other, and love each other. And I get to say goodnight to them. Of course we use other technologies to keep in touch with each other from texting to videos, to just plain phone calls. The same courtesy is given to their mother when the girls are visiting me. As my friend Matt told me, I will miss a lot of events in their lives, and there are some that I will be able to attend. And when I do, those will be extra special. And those that I cannot, hopefully technology will give me the ability to share in those memories. But with everything we currently have, I would have only myself to blame if I did not get to “see” or talk to them each and every day.